How do I ensure learners understand my course and prevent skipping? b) set the minimum score that learners must attain in a quiz to proceed to a new chapter. Step 1. Go to My Courses and click on "Edit Settings". Step 2. Under Security & Tracking tab, choose "No" option in "Allow Skipping Pages. Step 3. 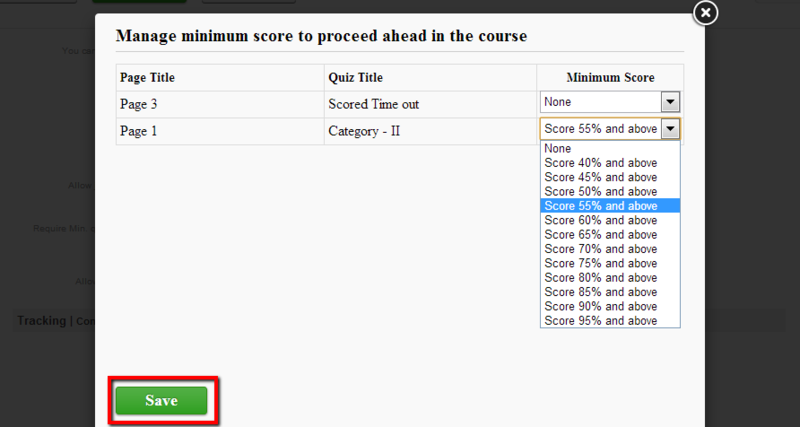 To assign points to your quizzes, choose the "Selected quizzes only" option and click on Manage Score. Step 4. Once you click on Manage Score,you can assign the minimum score that each learner must get in your quiz to move ahead in the course.